They say that love is blind, and in the context of any collectible item (regardless of what it maybe) any deviation of the norm of that item which makes a unit of it more distinct is seen as especially lucrative and desirable. For the Audi Quattro, when it was first released for sale, each and every model sold had the Quattro spelt with a capital Q. 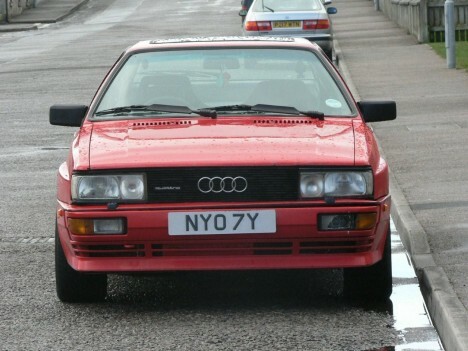 A few years later the company decided that all subsequent models would have the name in lower class lettering and this seemingly trivial alteration has prompted something akin to a quest for many an Audi Quattro collector who wants to be the proud owner of one of the original series. Spare parts for the Quattro model are becoming even more scarce and so many collectors are having to pay substantially high amounts simply to get even the most basic of components. The Quattro derives its name from the Italian for the number four, so inspired as the Audi Quattro was a 4×4 vehicle released by the Audi franchise in order to take full advantage of the (then) relaxed rules concerning the vehicles which were eligible and permitted to engage in rally car racing. The Audi Quattro whilst being in production for a decade had a very limited number of vehicles actually manufactured, in total just under 11,500 units were created worldwide. The overwhelming majority of these sales took place in Europe and whilst some tentative attempts were made to try to break into the Northern American and Canadian markets these were abortive attempts that failed miserably. Less than 700 units were purchased in the US, and in 1986 only 3 were actually purchased across the USA. The Audio Quattro was something of a walking contradiction so to speak, it had the dubious honour of being the first sports car of its type to actually make use of a electronic engine management system, the only downside to this was that the system was rather rudimentary, and certainly not to the usually exceptionally high standards that Audi had became renowned for. This system ended up alienating many a consumer who felt that it was too gimmicky and given the rather steep price tag of the Quattro, it was a bloated feature, which simply did not justify the cost. There was a great deal of concern among the marketing executives that they would not be able to successfully break into the UK market, as there was a great deal of concern that the cost of converting all of the current models to drive on the right hand of the road would not be justifiable. Whilst initial sales were rather lackluster, in due time the UK quickly became Audis dominant market. 1985 was a significant year for the Quattro as it underwent a major revamp with a full image work over , although these changes were overshadowed by the rather sudden and (some felt excessive) increase in the price which clocked in at a rather hefty 76,000 deutchse marks.